Dress and Textiles, Portraits: British 18th C 10 comments Any information on the style of Mary's gown to help date the painting? I'm hoping that someone with a knowledge of eighteenth century fashion and clothing could help in establishing a date for this portrait catalogued as 'Mary Trelawney'. 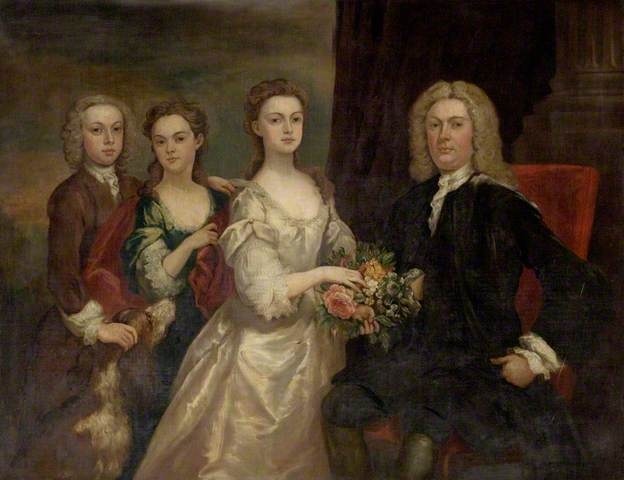 It is believed to be Mary Trelawny, mother of Samuel Pollexfen Trelawny who may be the subject of 'Samuel Trelawney' also in Plymouth Museum's collection (http://www.bbc.co.uk/arts/yourpaintings/paintings/samuel-trelawney). Mary was married in 1734 and Samuel born in 1737 so one would imagine dates of circa 1734 and 1744 respectively. However the two preceding generations of Trelawnys both contain a Mary and a Samuel so it is possible that both portraits may be two or three decades earlier than suggested. Any information on the style of Mary's gown or on Samuel's clothing would be greatly appreciated to help tie down exactly which Trelawnys these are. PS. I noticed the Joseph Highmore portrait of an unknown woman, 'previously called, Maria Gunning, Countess of Coventry', at Waddeson Manor on a visit there yesterday.Acc No 2170. ( see attachment) On the look out for portraits of same date as Mary's portrait. 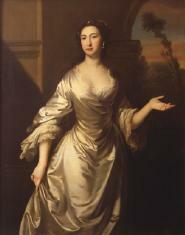 Maria Gunnings 's dress, hair etc are very similar, though the Highmore portrait is dated to 1745. 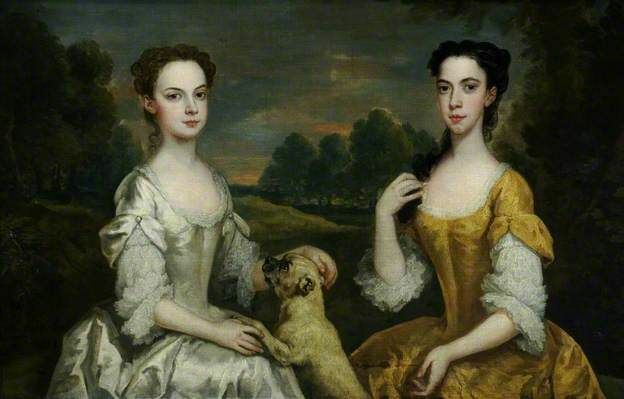 I would suggest that the Waddeson Manor Highmore portrait is in fact also around 1734. By 1745 the dress style would have been very different. If you have a look through The Complete Catalogue of Allan Ramsay's Paintings by Alastair Smart (1999) you will see that the type of costume worn by Mary was in fashion from at least 1735 to 1745. Thank you both for your help, I think that establishes that we are looking at the right generation of Trelawnys. Lou, I'm intrigued by your suggestion that the decorative sleeves may be the artist's embellishment, do you mean to imply that it was common practice to 'bling up' provincial portraits. The Art of Dress, Fashion in England and France, 1750–1820, Yale Univ. Press. Lou, thank you for the link, that's helped to clarify things for me. There is another aspect of the painting that is interesting to me and that's the drapery at bottom left, which has presumably been pulled aside to reveal the sitter. I had assumed that, like the feigned oval, this was a commonly used pictorial device typical of the period. That is until I started to look for another example. So far I've drawn a blank. Can anyone recall (and perhaps link to) work/s with a similar use of this device? I hope I'll be forgiven for resurrecting this thread but I thought it worth another try to see if I can generate some answers on the point I made in the post immediately above this one. Has anyone come across the same or a similar use of drapery apparently pulled aside to reveal the sitter in other portraits from the same era? I have not been able to find a single example in paintings of the time. The nearest comparison I have found is in some contemporary engravings of historical subjects such as the English kings and worthies produced by George Vertue but no direct equivalent in a portrait of a contemporary commoner. Hogarth uses it for one: http://www.bbc.co.uk/arts/yourpaintings/paintings/the-painter-and-his-pug-117666. Though the illusion created here is different - is there any evidence that the work has been cut down? I'd forgotten about the Hogarth, I suppose one remembers the dog first and foremost, although as you say the illusion (and perhaps the intention behind it's employment) is different in this case. And there are no obvious signs that the painting has been cut down, nor does the drapery in question appear to be a later addition, the varnish and craquelure all seem to be of a piece. The last comments on this discussion were added three years ago. Would anyone like to contribute further?